Live in a big city and you risk suffering from fumes, breathing difficulties, even premature death. Yet the government has spent 10 years in denial about the United Kingdom’s (UK’s) air quality problems. The rest of us know differently and action is long overdue. For change to happen, UK citizens look set to have to rely on the European Union’s (EU’s) legal framework that first put legal force behind World Health Organisation (WHO) guidelines for air quality in 1999. 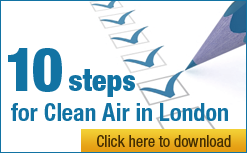 That framework was updated on 11 June 2008 when a new EU directive on ambient air quality and cleaner air for Europe entered into force (the new AQ Directive). Now we need that directive to be translated into action. Poor air quality has serious implications for public health resulting in between 12,000 and 24,000 premature deaths each year in the UK – those with asthma, lung diseases and heart conditions, particularly the very young and the old, are most susceptible. These numbers compare with some 617 such deaths per annum from workplace-related passive smoking before recent legislation came into force and up to 22,000 premature deaths per year related to alcohol consumption. The Rogers Review in 2006 stated that, in 2005, the UK’s annual cost of health impacts from one form of air pollution alone, called particulate matter (or PM10), was between £9.1 billion and £21 billion per annum. Aside from the terrible human cost, the economic case for action was made in the government’s own Air Quality Strategy in 2007 when it stated that ‘policies in the road transport sector and electricity sector have been shown to be very cost beneficial with benefits estimated to have exceeded costs by up to a factor of 24’. This public health crisis is not surprising when air pollution near our busiest streets is so bad. During 2007 in London, for example, the average annual concentrations of a toxic gas called nitrogen dioxide (NO2) in Marylebone Road, Kings Road and Brompton Road were 102, 91 and 94 micrograms per cubic metre (μg/m3) respectively (and they have started five to 10% higher in 2008). These measurements compare with the WHO’s guideline, set in 2000 and re- confirmed in 2005, and backed by EU law, of a maximum average annual concentration of 40 μg/m3. The air we are breathing in hardly bears thinking about. Nearly 10 years on, the government has failed to deliver WHO recommended standards of air quality throughout the UK. Fortunately, Article 22 in the new AQ Directive provides, amongst other things, that the UK cannot get a time extension from meeting its legal obligations for NO2 by January 2010 unless it ensures that average annual concentrations of NO2 remain below 60 μg/m3 thereafter. This means that air pollution near London’s busiest streets, for example, must be reduced by more than one-third in just over 18 months. One result of Article 22 is that it could stop the Heathrow expansion in its tracks. This issue should also concern London Mayor Boris Johnson as he reconsiders the western extension to the Congestion Charging Zone. Then there are the London Olympics in 2012. The organisers would face a public relations disaster if the European Court of Justice took enforcement action against the UK for breaching Article 22 in the months leading up to the Games. The legal obligations rest on the UK as a Member State. At the Campaign for Clean Air in London (CCAL), we are confident that the European Commission will take robust, early enforcement action against the UK for three reasons. First, without it, the EU’s broader air pollution strategy, including its post-Kyoto climate change negotiations, will be a ‘laughing stock’. Second, with the new AQ Directive being a hard-fought compromise between those who wanted to achieve all the WHO’s standards for air quality and those who wanted delay and greater flexibility, it would be unthinkable for the European Commission to fall at its first enforcement hurdle. Third, the UK (and London in particular) can be singled out for the scale of its NO2 breaches. Enforcement action could take place this year or early in 2009 in respect of PM10 breaches. The government has admitted that road transport is the cause of all breaches of air quality laws in the UK with diesel emissions being by far the biggest single component. The solutions involve two overlapping ‘circles’ of measures – one for congestion and the other for emissions – that target the most polluted areas with technology-based solutions and create a ‘tipping point’ of behavioural change backed by awareness, persuasion, incentives and regulation (when necessary). In one ‘circle’, road pricing is essential, fair and much needed in areas like central and west London, to tackle congestion and ‘make the polluters pay’ since vehicles produce less than half as much air pollution once their speed reaches 30 kilometres per hour. It should operate seven days per week. In the other ‘circle’, we need an additional, inner, Low Emission Zone (LEZ) at least in central and west London to reduce harmful emissions. It will join dozens of others around Europe which target the most polluted areas of large cities. Unless the government sets, belatedly and soon, national standards for the abatement of emissions of oxides of nitrogen from older diesel vehicles of all the main types, these vehicles must be banned soon by LEZs from the UK’s most polluted streets. There are clear environmental, social and economic reasons for improving the UK’s air quality quickly. Despite this, the government has shown itself incapable, over 10 years, of mustering even the political will needed to meet its environmental obligations. It has listened to the same siren voices that argued against the creation and enforcement of the Clean Air Act introduced in 1956. We need a new approach urgently from the government and Mayor Johnson that will give stakeholders of all types, whether from business, the non-governmental sector or citizens generally, the certainty and time necessary to play their full part in delivering the required changes in the most cost effective manner. Failing that, we shall have to urge the European Commission to take robust action to defend WHO-based air quality laws. Article 22 appears on page 10.